Sporting Lisbon have "vehemently condemned acts of vandalism and aggression to athletes" after a group of fans reportedly attacked players and trashed the club's training ground. Sporting are preparing for Sunday's Portuguese Cup final against Aves. Portuguese newspaper Correio da Manha posted pictures of forward Bas Dost with several bad cuts on his head. The club missed out on a Champions League place on the final day of the season. After the alleged attacks, a club statement read: "Sporting is not this, Sporting cannot be this. The Portuguese League also released a statement "strongly condemning the violent acts". "The behaviours that are being reported by the press are regrettable and have no place in professional football. The perpetrators are not football fans, but criminals." 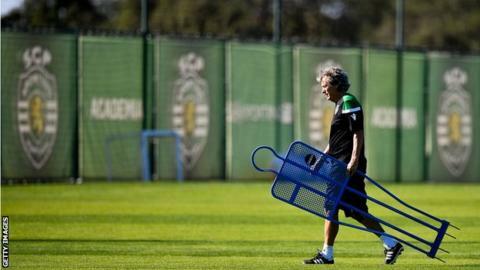 Earlier in the day, the club had released another statement denying reports head coach Jorge Jesus had been suspended. In April, president Bruno de Carvalho claimed to have suspended 19 first-team players after a Europa League defeat by Atletico Madrid, although he deleted the post and most of the players featured in their next game.